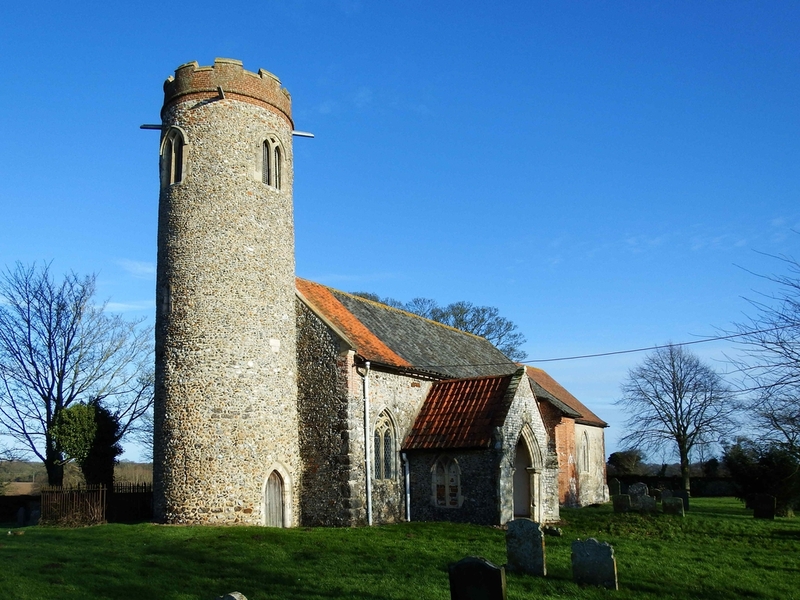 This fine old Norfolk church lies just to the west of the village of Sustead. It has a round tower and is dedicated to St Peter and St Paul. The dark brown corner-stones of the building show this was a Norman Church. The Y-tracery bell-openings to the round bell-tower indicate it was added in the 13th century. The tower is entered from the outside by a southern door rather than from the usual tower arch. The south porch has delightfully flamboyant tracery of the Decorative period. Medieval graffiti can be seen on the opening jambs. Medieval stained glass in the southern nave windows show angels playing musical instruments. Victorian stained-glass in the chancel is also note-worthy. The churchyard is still used for burials and the interment of ashes.